(3) adjustable acrylic pockets give plenty of space for magazines. Brushed aluminum finish matches any décor. 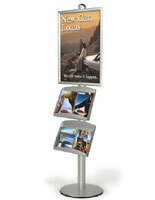 Combination graphic holder and literature stand great for areas where space is a concern. 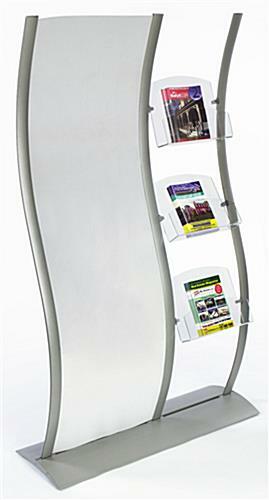 This catalog holder, floor magazine rack gives your business a unique display that attracts customers. 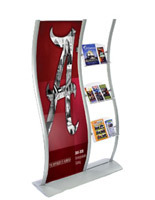 Retail fixtures, literature stands, and other floor magazine rack choices have (2) protective lenses that help to hold graphics in place. 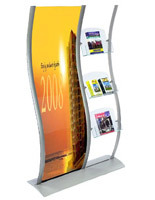 Two posters can be placed into the protective lenses to create a double-sided display. 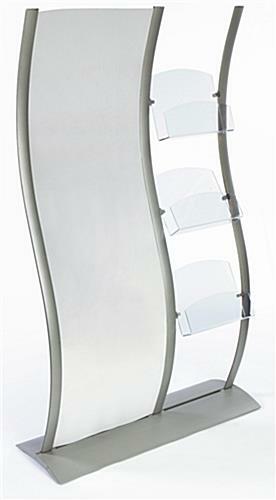 The floor magazine rack has (3) adjustable acrylic pockets. Put publications of varying sizes in easily with the adjustable pockets. 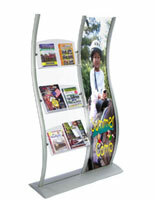 The magazine rack merges a poster display with a literature stand into one eye-catching promotional display. 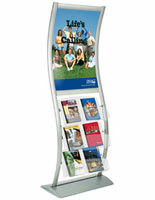 A catalog stand is the perfect floor magazine rack for heavily trafficked locations. 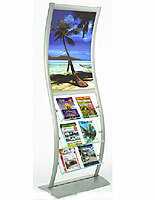 The floor magazine rack, also known as a literature display, is made from brushed aluminum. Brushed aluminum is durable aluminum coated with silver for a strong, attractive display. 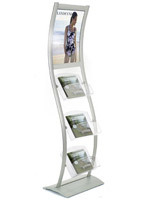 The retail stand, floor magazine rack is designed solely for indoor use. This display fits a 24" x 77" graphic. 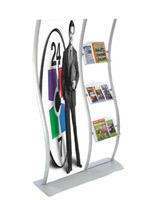 Draw customers into your products by placing this magazine rack into your marketplace today! Please Note: Graphic is not included with magazine rack. When designing your images, keep in mind actual graphic size is 24"w x 77"h, where 1/2" on each side is covered. Your graphics should be printed on regular poster paper, so as to ensure they will fit securely within the grooves. This will not be a problem for any printing service facility. 16.0" x 13.3" x 3.5"